While all the aspects of making a good painting were covered, I think an important realization for me is the power of not blending. 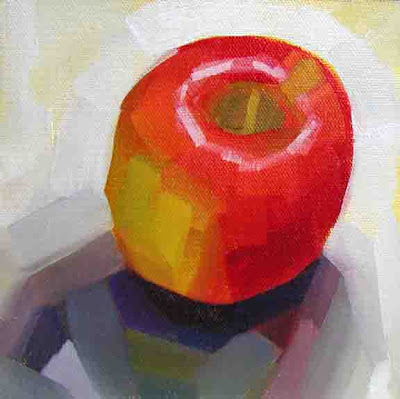 The apple painting in this post demonstrates this point. We were instructed to paint every stroke with a different color and not blend them together. While it is tempting to make up a big glob of a color and paint away like the picture is the side of a barn, it makes for a much more interesting painting if the color is varied. In the piece above, you may have to stand back from it a ways, but I think the point is made. I am going to practice this some more. 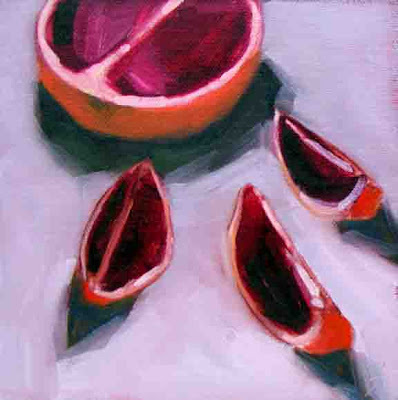 I have really enjoyed the still life painting that I've been doing this winter, culminating in the Carol Marine workshop. But now that spring is on the way I would like get back to landscapes, and to apply the techniques that Carol taught, to that domain. I am still trying to figure out what that means. 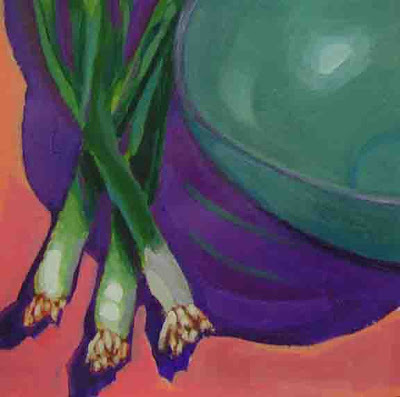 This one is from the third day of Carol's class when we were studying color and how to get color combinations that really work. I couldn't resist orange and lemon slices. Do you think the background colors work? 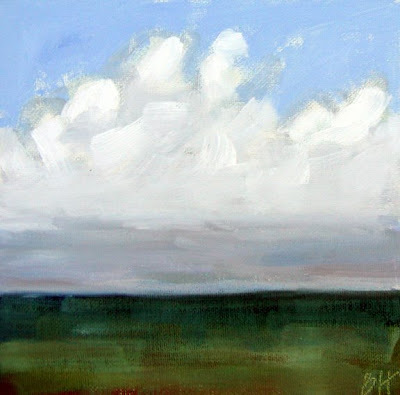 This is my favorite piece from Day 2 of Carol's workshop at the Corse Gallery in Jacksonville, and an awesome day it was. This workshop is hard work and well worth it, the best workshop I have ever been to. Suzanne and I went to the grocery store on Friday night and filled our basket with interesting colorful fruit and vegetables to paint. I couldn't resist the blood orange. This is my rendition, with a little help from Carol. What a great workshop! Carol did a demo this morning of orange sections and a knife on a green plate. Check it out on her blog (http://carolmarine.blogspot.com) when she posts it. 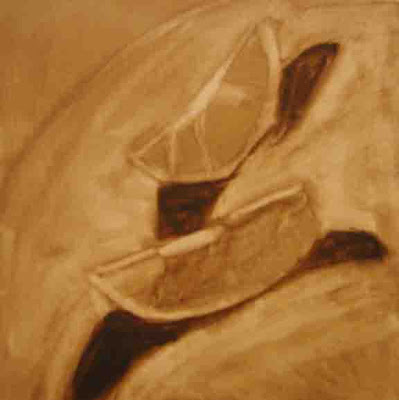 After lunch we did value studies in burnt umber. 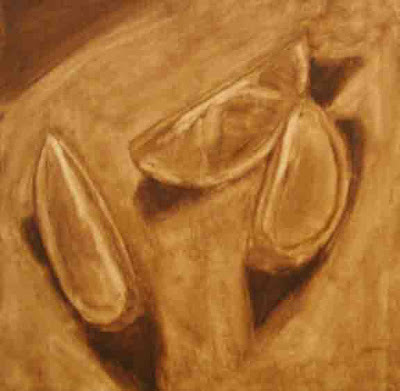 The idea was to, in increasingly shorter periods of time, do studies where the dominant value, secondary value, etc. were identified by the painter and then clearly portrayed. This one took me about half an hour, though it started out as my 15 minute effort, and got some additional work later. I found this difficult at first, and my first 30 minute attempt got wiped. This one was done in five minutes, as timed by Carol. It is amazing what you can do in 5 minutes when you have a little practice beforehand. This one was done at Bowman's Beach on Sanibel on Tuesday. The water was the most beautiful green color, which I actually captured in the painting, but is not well reproduced here. 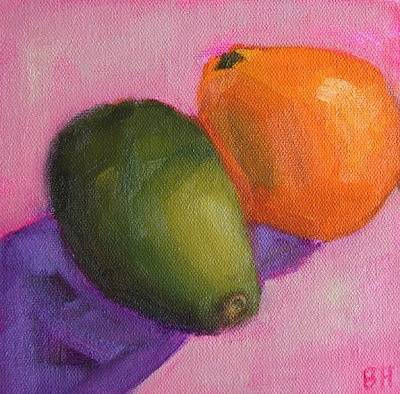 I am not happy with the colors in any of the photos of the oils done here in Florida. I am not sure what the issue is, since I don't have this problem in Maine. Even Photoshop is failing me! If I can take better pictures when I get home, I will replace these. Off to Carol's class in a few moments... More tonight. 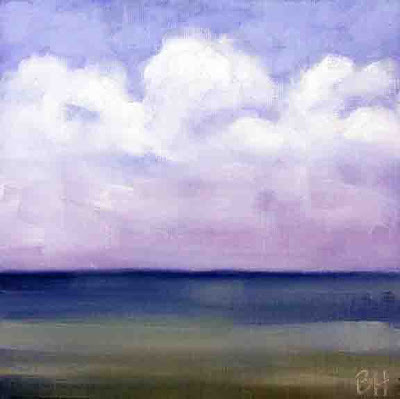 I painted this one on Tuesday at Bowman's Beach, farther north on Sanibel than where we stayed. Mary and I were there for 5 hours and I painted the whole time. It was glorious, the colors changing as the sun moved across the sky and clouds began to come in to the east. I did another one, but the picture is blurred. I will try to get a better photo first thing tomorrow. Yesterday I drove from Sanibel to Jacksonville, where I picked up my friend Suzanne at the airport and we drove on to Fernandina Beach on Amelia Island (you can tell I like islands). We had an awesome time there today, which I will recount in a later blog, since it is so late. Tomorrow we begin our Carol Marine class in Jacksonville, which we are both excited about. Today Mary and I went to Bowman's Beach, which is up-island from where we are staying on Sanibel. It was beautiful and the shelling was better there than near our place (which is closer to the lighthouse). The painting was awesome too. The photography is another story. I'm having a great deal of difficulty taking photographs of the oil paintings. I had it pretty much down for the gouache work, but it seems to be too late in the day before I get to it here on Sanibel for the oils. So despite two successful paintings today (and one wipe off) plus one left over from yesterday, I have no artwork to show you. 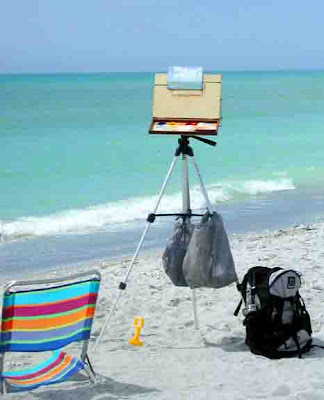 Instead I thought I would talk about gear for painting on the beach. Gear is always fun, right? At the top you see my painting backback (just a regular Yakpak from Staples) containing my 10"x12" Open Box M paint box, with tripod attachment, and painting holder (hard to see, but it's in there - more on this in a later post). Note the brushes in the right side pocket and the metal jar of odorless mineral spirits in the left side pocket. 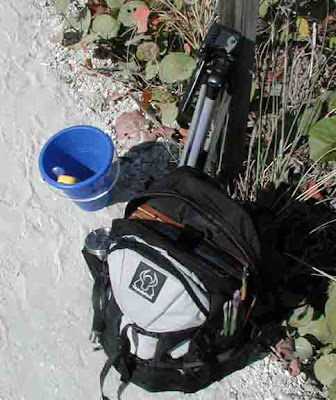 The tripod is behind the backpack and the bucket and shovel are for putting together the important ballast of sand to hold the tripod in place in the breeze. If I can get a good internet connection tomorrow night I'll post the paintings. Tomorrow I drop people off at the airport in Fort Meyers and then drive across the state to meet an artist friend at the Jacksonville airport, and then on to a day on Amelia Island followed by the 3 day Carol Marine course at the Corse Gallery in Jacksonville. Can you think of a better art week in Florida? 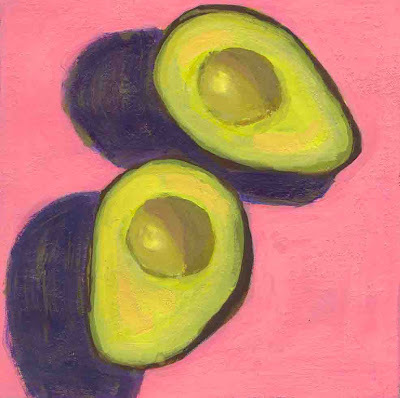 This is the promised honey bell orange with an avocado. I did this one yesterday, after the wipe out on Saturday. 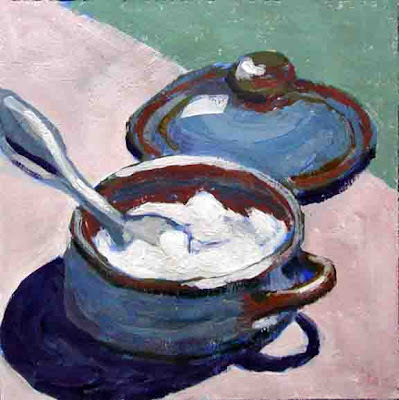 It was good to go back to something familiar, like a still life, to make the transition from gouache to oil. This poor avocado is still waiting to be eaten, but we have muched the honey bell and about a dozen of its best friends as well! Today I painted AT THE BEACH. I went back and forth on that idea for a while; all that sand, my nice Open Box M paint box and tripod... but is was irresistible. And it turned out to be enormously fun. The ocean was green and the clouds were less dramatic than on the previous days, but there does seem to be a bank of clouds over towards the land side of the island that is pretty much always there. I did another one of the beach, but it needs a little more work tomorrow. It was also fun to chat with the people that stopped by. They are from everywhere. It was a scramble getting ready last week, but at last I am in Sanibel Island, FL with my sisters and dear friend Mary. We arrived late Friday night and got ourselves organized yesterday. Since I'm on vacation and have more time, I switched back to oils. I wiped off my first attempt and today was better. 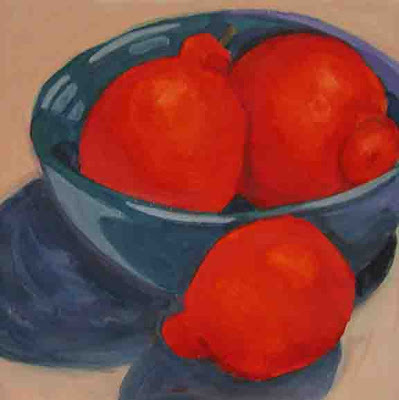 I started with a still life which I'll post tomorrow, with a wonderful orange-like fruit called the "honey bell." Apparently this is late in the year to have them, but we are so glad, absolutely the sweetest orange flavor ever. But I rushed taking the photo and can't even Photoshop it into something like the real thing. 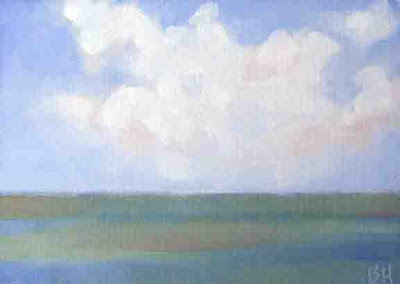 Then I did this study of the ocean and clouds from a photo I took yesterday. The water was very dark and dramatic. I think if you look long enough at the ocean you can find every color of green and blue and brown. It was the clouds that got me. And today there were more, but it was all aqua and lightness instead of the dark. I hope I can capture it. I bought this mug because I loved the bright shiny red color. The bonus is the reflections that come up when you put something close to it. Aren't they great? A challenge with the mug is getting the orientation of the handle right, and I think I managed it here. Yesterday I got a couple of new colors in gouache, including an orange which I used in the second pass over the mineola. I think it works. By popular demand, the avocado has returned, but this time with the pit. I am not sure about the shapes, but I am happy with the avocado greens. Does the pit add to the composition? 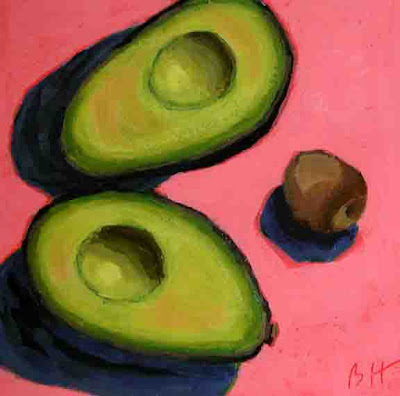 I have been eying this avocado on the window sill for days, thinking about how to paint it. Sliced, of course. Strong shadows are important. But with or without the pit? And from which vantage point? I decided that the shadows in the holes would be more interesting than the pit, and did sketches from two vantage points. This one was the most interesting. A comment on getting that "avocado green". All of the gouache paintings shown so far on my blog have been painted with a limited palette of Da Vinci ultramarine blue (404), yellow medium (493), red (475), and titanium white (490). Occasionally I add a small amount of quinacridone rose (Graham). I have ordered a darker Da Vinci yellow, because I find this one not as opaque as I like (see the Mineola Blues post). I like the unification I get from a limited palette and the simplicity of using only a few tubes of paint. 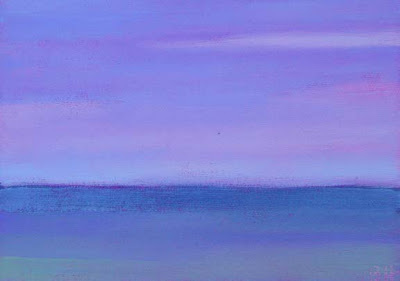 As a result, one of the things I feel I have learned the most about by daily painting - is color mixing. And I don’t mean just hue, but also dull versus bright and the amount of white to mix in. 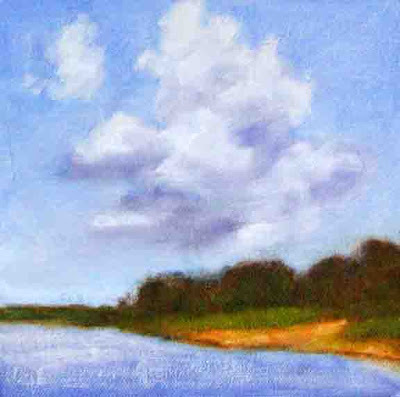 It is a great feeling to be able to re-create a color previously mixed (it satisfies my need for control!). I still need more practice creating every color that I see in an object, but progress is definitely being made. I couldn't resist the scraggly ends on these guys. And they just seemed to go with the bowl. I have fallen into a pattern of taking more than one session to complete a painting. So I am painting daily, but not completing a painting each day. I need to figure out why this is happening! In the meantime this is a piece that I did during my first week of daily painting (three weeks ago) before I started posting them. And it only took one session. I love this dish, which I bought many years ago in England and was meant to be for butter. I have always used it for sugar. When I showed the painting to an engineer friend of mine, he looked at the title and said "What do you mean? There is only one spoon in this picture!" I like the way this one turned out. 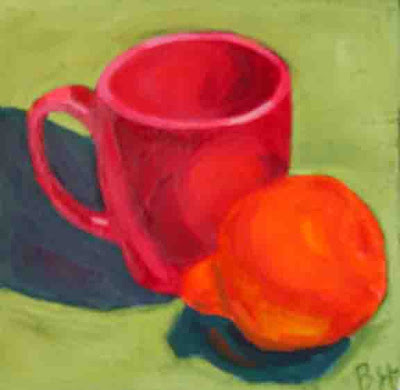 Orange things - they're tough in gouache. 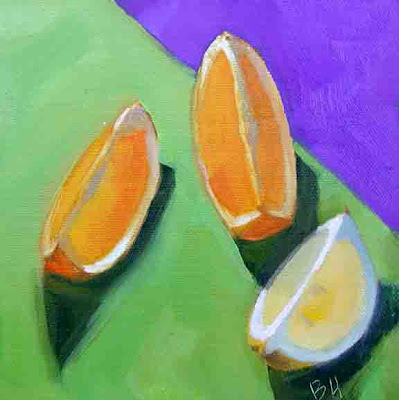 A few weeks ago I tried painting clementines. You know those small sort of squashed looking orange-y things that the peel just slides off of? I live on them in the winter, such a jolt of sunshine. But painting them was not happening. I made three attempts: the first was too red and dark, the next too light - and like striped billiard balls, and on the last attempt I lost the shape altogether. So I gave myself a couple of weeks away from orange things, but I couldn't let it go. This time I tried mineolas, love that knobby end the stem comes out of, it gives them some structure. And I remembered this blue pottery bowl. This is much better than the clementine efforts, but I think veering a bit towards water color. I was having trouble making the yellow gouache opaque, and when I add white to the cad red/yellow mixture it really dulls down. Perhaps this is the time to try another brand. I do like the bowl and mineolas together, maybe I will give it a go in oil.